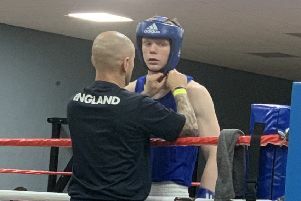 Luton boxer Jordan Reynolds heads to the Echo Arena in Liverpool this weekend to compete in the England Boxing Elite National Championships. Reynolds has been seeded third in the 75kg category that begins on Friday and is in the same group as top seed Troy Williamson (Darlington) and Louis Cunningham (East Durham), seeded two. Also at Reynolds’ weight are Noel Smith, Daniel Woledge, Hamir Sediqy and Jack Flatley, with Reynolds up against Williamson, Cunningham and Woledge. Reynolds said: “This is the biggest championship you can ever win in England so just to get where I am now is an achievement as I’m boxing in the Echo Arena on Sky Sports. “I’m more than confident I can win this as I’m far by the youngest in the group and just gone up to middleweight as well.